Royal Mail will be issuing a new series of miniature sheets 'The Four Countries of the United Kingdom' focusing specifically on Scotland, England, Northern Ireland and Wales. Each sheet will consist of three new stamps and one existing country definitive and will be issued on the respective Saint's Day. The first minisheet in this series, focusing on Scotland, will be issued on St Andrew's Day 30th November 2006, and will be supported with the usual range of stamp products. The sheet contains two definitive-size stamps, one being the existing 1st class Lion, and the other being a redesigned Scotland flag (Saltire) also 1st class. 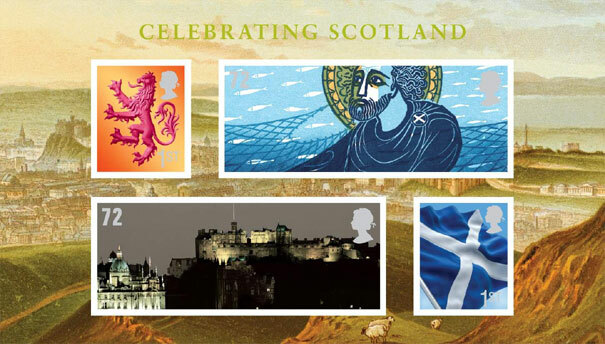 The two 72p stamps are 24x60mm (ie 3x the size of the definitives) and show St Andrew and Edinburgh Castle. Issued in 1999 as part of Country Definitives issue, designed by Tayburn with photography by Julyan Rawlings. For Scots at home and abroad, St Andrew's Day is an opportunity not only to celebrate their patron saint but also their national identity. On November 30 every year, across the globe from Scotland to North America and Australia, from Gambia and Mongolia to Papua New Guinea, dinners and ceilidhs are held in honour of the fisherman from Galilee who became Jesus's first disciple. St Andrew, who is also patron saint of Greece and Russia, was crucified for his beliefs by the Romans in Patras, part of modern Greece. Edinburgh has been the Scottish capital since the 15th century. It has two distinct areas: the Old Town, dominated by a medieval fo rt ress, Edinburgh Ca stle; and the neoclassical New Town (both of which have been World Heritage sites since 1995). Edinburgh Castle stands on an immense rock dominating the famous Princes Street and Scotland's capital city. It has withstood the turbulence of events in Scottish history, but not without partial destruction and centuries of neglect which persisted until the mid-19th century. Today it houses the Honours of Scotland (the crown jewels) and is the location of the Edinburgh Tattoo, a hugely popular tourist attraction. Scotland's Saltire flag, representing the X - shaped crucifix on which St Andrew is said to have died, is among the world's oldest. Popular myth states that the white cross on a blue ground commemorates a shape which appeared in the clouds to the Pictish king Angus in the early ninth century, when his kingdom was under attack by Northumbrian ruler Athelstan. Despite being heavily outnumbered, with this saintly support, Angus's men routed the invading army. Sheet design: Silk Pearce. Illustrations of Saltire and St Andrew by Peter Crowther, background/border illustration by Mary Evans Picture Library. The 123x70mm sheet is printed by De La Rue Security Print in gravure. The definitive stamps are perforated 15x14 and the larger stamps 14½x14. All stamp and postmark images are copyright 2006, Royal Mail. 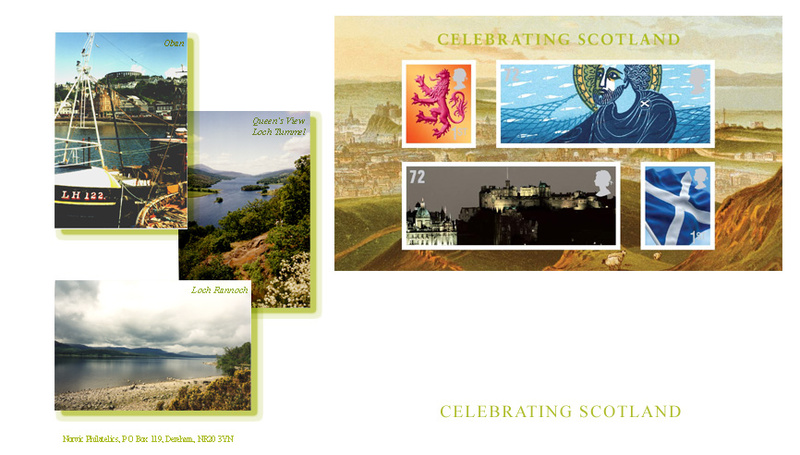 Our exclusive FDC for this sheet shows three of the many favourite places in Scotland: Loch Tummel, Loch Rannoch and Oban. It comes with a choice of postmarks L10303 or S10304 - Price £6.75. Wembley Stadium - Miniature sheet - 2007?